For years I had been meaning to get round to reading Norman Mailer’s The Fight but somehow other books kept diverting me away. Finally, a couple of months ago I bought it to read on my Kindle on my commute to work in London. I had watched the October 1974 boxing bout between Muhammad Ali and George Foreman, the legendary Rumble in the Jungle, many times on YouTube and had been impressed with Mailer’s commentary on the fight in the Academy Award winning 1997 documentary When We Were Kings, so it was with much excitement and anticipation that I began to read his book length take on the fight. A word of warning at the outset: in this nineteen chapter book, the actual description of the fight does not begin until chapter thirteen. Don’t let that put you off though. 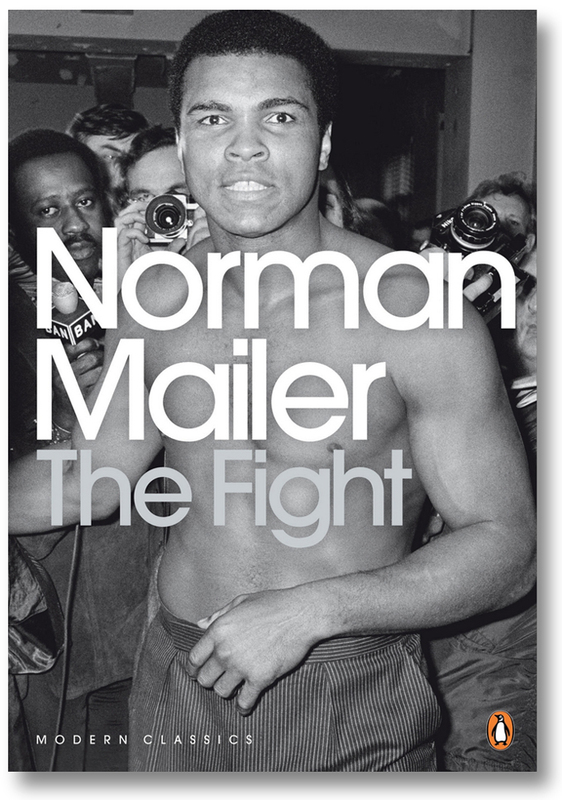 Mailer was a giant of twentieth century American literature and his observations on the build up to the fight and his encounters with the characters surrounding Ali and Foreman, including Bundini Brown, Don King and not least, President Mobuto of Zaire, are fascinating and add much colour to the background of the fight. Ali at this time was thirty-two years of age and widely regarded as being past his prime. He had cruelly and unjustly had his championship taken away from him in 1967 after refusing to be drafted into the army for the Vietnam war and had been banned from boxing for three and half years – years when he should have been in the pinnacle of his boxing career. Now, seven years later, while he was clearly eager to regain the Championship, boxing commentators openly questioned whether he was still as quick with his hands and able to dance around the ring as he had so dazzlingly been able to do in his younger years. How would an older and slower Ali be able to avoid being hit by Foreman’s murderous punches? Ali certainly saw a bigger picture. Mailer notes that Ali saw himself as a tool in God’s plan. He would create history by beating Foreman against all the odds. He would then use his resulting fame and influence for the benefit of poorer black people. To this end Ali did not merely rely on his prayers, but trained appropriately. Mailer even went running with Ali late one night until he ran out of breath and had to walk back to Ali’s camp alone in the dark. He tells us that his heart started beating much louder and faster when he heard what was unmistakably the roar of a lion. Later that morning when Mailer shared this story with other colleagues from the press who were there to cover the fight, they laughed and pointed out that Ali’s camp was very close to the zoo. And on to the fight itself. Mailer was sitting in the second row just behind the photographers and live radio and TV commentators. Just before the fight begins, he describes the posture of the two mighty warriors. For those who haven’t seen or heard about what then happens in the fight I won’t reveal any more…apart from saying that Ali triumphs! 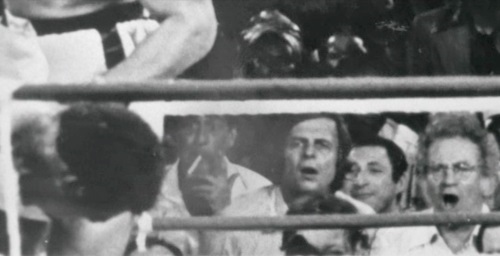 We are fortunate that the open mouthed and flabbergasted reaction of Norman Mailer and (on the left) boxing journalist George Plimpton to Ali’s knockdown of the mighty George Foreman has been captured in a wonderful photograph. Mailer’s book rises admirably to the occasion and is a splendid reminder of an encounter that will long be remembered fondly and with much love by all who have been fortunate enough to watch The Fight. Ali somehow lifted us all up. This entry was posted in Books and tagged george foreman, muhammad ali, norman mailer, the fight. Bookmark the permalink.